Beautiful hand carved study of a racing toad from lime wood. 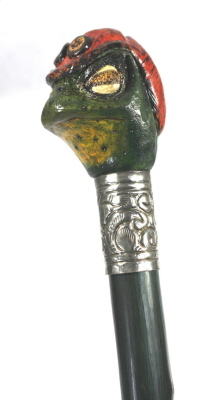 The hand carved toad study country walking cane has a choice of collar finishes be it a standard nickel plate or brass collar. For something more spacial we provide a hand made sterling silver collar with full Assay Hallmarks for London. Alternatively, a hand planished copper and sterling silver collar. The racing toad is available to be mounted is mounted on fumed chestnut in the colours blue,green or red/amber. Alternatively, we have some beautiful apple shaft that are oiled and ready to go. In addition, you have a choice of the type of base ferrule in relation to your requirements. A rubber ferrule arrives as standard. Again for a more specialised country walking cane,we offer the addition of a the combination - spike with rubber ferrule. The cane is made to order with an arrival time of approximately 4-6 weeks.